Holding the title of desert warrior, the cactus alters human consciousness, offers moments of contemplation, protects and ornaments shop-windows and waiting rooms, it dances on TV shows, where it also seems to speak Mexican, if not Japanese… As a tragic-comic figure, it cannot escape the laws that bond it to both natural and artificial grounds. Is it its prickly costume of an eternal “guerrero” – frozen in a position of “self-defence” – that manifests its more evident “self”? What gives humans the desire to recognise it as a possible “alter ego”? A bold accomplice for resistance? From fable to farce, the exhibition Inter-passion by the artist and filmmaker duo Elise Florenty & Marcel Türkowsky, presents the first act of a project which explore the rather not known but quite common relationship, “kin(d)ship”, between human and cactus. By looking at the inter-relation or rather inter-passion of humans for this plant, i.e. how the cactus’ form and materiality can affect human actions and passions, the artists have investigated the subversive potential of representations of this relationship. They reveal shifts of perspectives, roles and power-positions, through methods of mimicking, teaching and possessing. What is at stake here is a double mirroring in which the cactus is “humanised” and the human is “cactus-ised”. Driven by a tension between botamorphism and phytocentrism, the exhibition draws a “derive” into various extraordinary geographies (from the Yakushima Forest to the Sonoran Desert) and connects both different kinds of minor stories and global gestures. 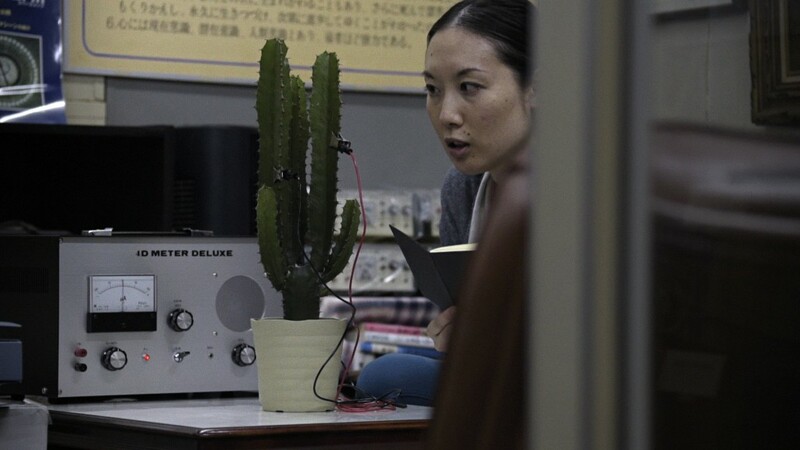 On display is their most recent film Conversation with a Cactus, shot in Japan (2017, 45min), and other “narrative nuclei” – installations mixing moving image (Hdv, celluloid film) postcards and movable mechanisms – that extend rhetoric aspects and metaphoric signs present in the film’s cosmology. Florenty & Türkowsky’s narrative threads entangle discursive as well as sensual elements on a platform of fictional, documentary and performative modes of representation. The two artists focus on the verge of a visible world and its withdrawal, questioning the modern separation between the human and the non human, the animate and the inanimate, the verbal and the non verbal. Looking at mechanisms of survival and possible forms of resistance, it is through the figure of the marginal that they connect to a subterranean yet extraordinary community of thoughts and affects. The exhibition is accompanied by the publication Elise Florenty & Marcel Türkowsky: One head too many. Une tête en trop. Ein Kopf zu viel published by BOM DIA BOA TARDE BOA NOITE with the support of the Cnap and Stiftung Kunstfonds.